The majority of consumers would gladly trade a few transactional bells and whistles on their mobile banking application for an interface that's easier to use. So why do financial institutions focus more on improving functionality instead of usability? Financial institutions tend to think they understand how consumers feel about banking in digital channels, but just as soon as everyone thinks they have a handle on everyone’s expectations and preferences, people’s attitudes shift again. You need to step back and reevaluate on a regular basis, so you can tweak both the actual products and the marketing messaging surrounding your digital solutions. Here are six insights from the Aite’s Digital Banking Engagement Report that will shape your consumer digital engagement strategy. 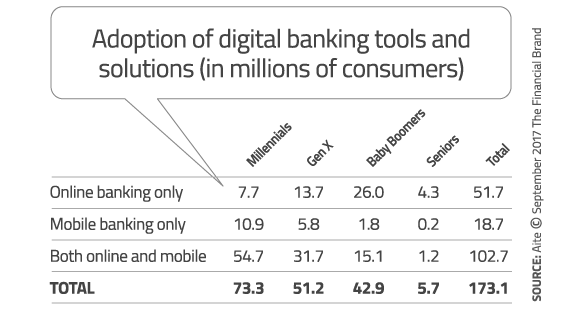 More than 173 million consumers are currently using digital banking solutions in the U.S., with Millennials and Gen Xers accounting for nearly 72% of those users. 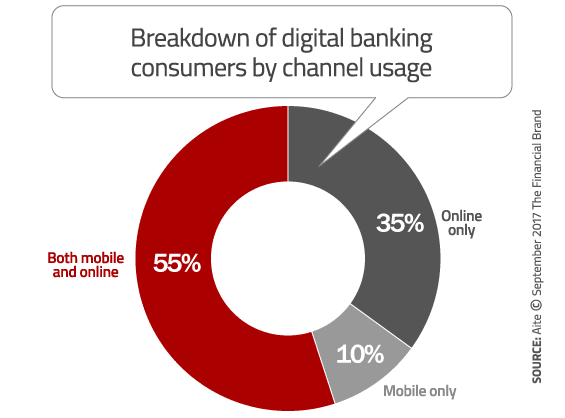 Of those 173 million consumers, nearly 103 million use both online and mobile, nearly 52 million use online only, and nearly 19 million use mobile banking only. By the end of 2021, Aite Group predicts the number of digital users to grow to more than 194 million, with Millennials and Gen Xers accounting for more than 73% of total digital banking users. Tip: Financial institutions can’t afford to favor one digital channel over another. You should also make the experience between channels as consistent and seamless as possible. Every age group — from Millennials to Seniors — prioritize ease-of-use over a robust feature suite. 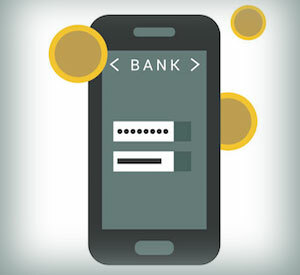 They would rather have an online banking and mobile app that is intuitive and simple than an app that can do every possible type of transaction a consumer might ever want. “Ease of use trumps functionality when it comes to consumer satisfaction,” says Aite Group Senior Analyst David Albertazzi. His message for financial institutions: double down on efforts to improve user experience. Tip: Even the digital natives (e.g., Millennials) appreciate an interface for online/mobile banking that’s easy to use. Get the interface right first, then focus on adding functionality. If you have to, sacrifice features to achieve greater simplicity. 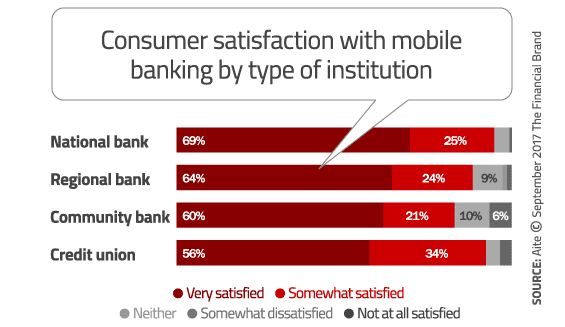 Consumers are happier with mobile banking provided by larger institutions versus smaller banks and credit unions. 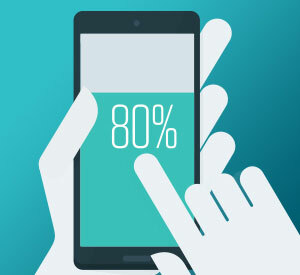 Only 60% of community bank users and 56% of credit union users are very satisfied with mobile banking at their institutions, compared to 69% at national banks and 64% at regional banks. 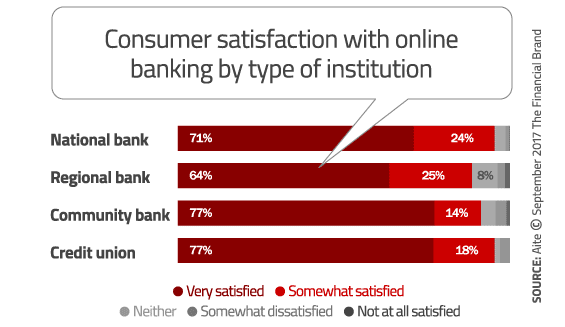 But community banks and credit unions outshine their larger brethren when it comes to consumer satisfaction with online banking. While 71% of national bank users and 64% of regional bank users say they are very satisfied, that percentage climbs to 77% for community bank and credit union users. Tip: Many community banks and credit unions joined the mobile game later than megabanks. 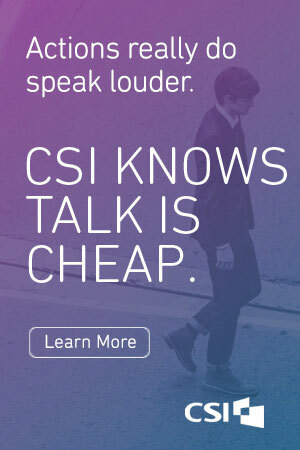 They need to catch up… quickly. That means accelerating their strategy and amplifying their focus on the mobile banking experience. Digital money management includes transferring funds between accounts, sending P2P payments and paying bills. The most popular transaction — whether online or via a mobile device — is bill pay. This remains fairly consistent across generations, with even as many as 39% of seniors saying they pay bills digitally. But other types of money movement transactions are strikingly different between generations. 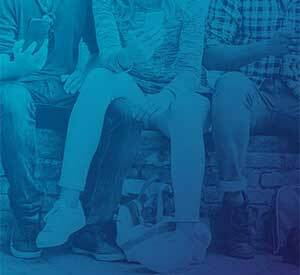 While 62% of active and moderate Millennial users transfer money to a friend, only 9% of Seniors and 20% of Baby Boomers have ever done so. 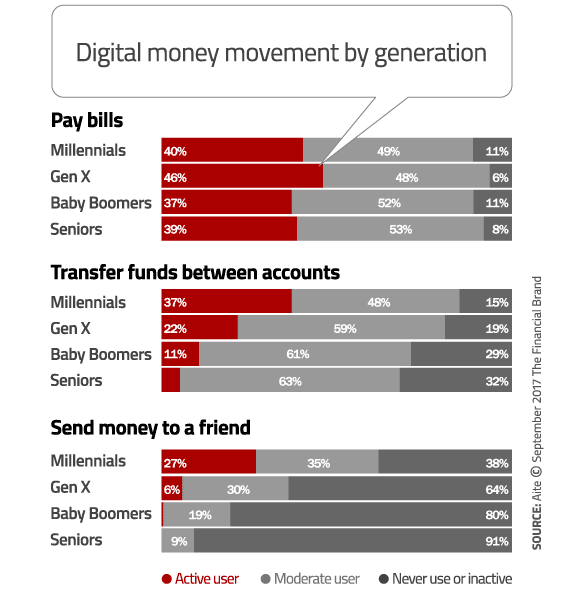 Millennials are also significantly more likely to use account transfers than Gen X, Baby Boomers, and Seniors. Tip: Bill pay remains one of the most sticky functions you can offer consumers. Make sure you get this right, or you’ll pay a heavy price (think: attrition). Aite measured the customer engagement of quick access and ancillary banking services, which include remote check deposit, viewing an account, balance without logging in, and redeeming rewards. 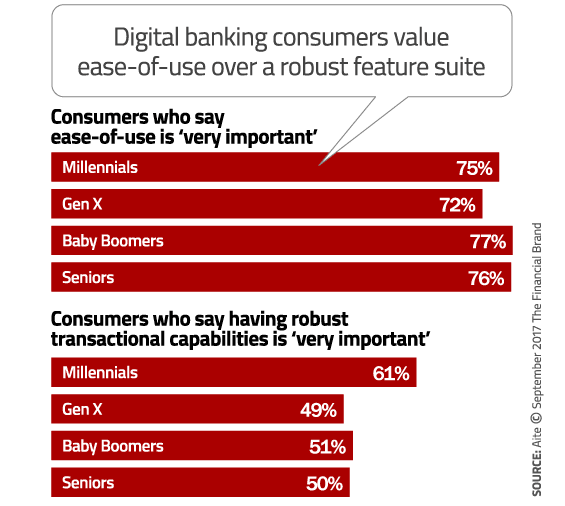 The research revealed that Baby Boomers and Seniors are less enamored with these types of services; most of the older generation does not use remote deposit capture or balance verification. However, 33% of Millennials and 23% of Gen Xers actively verify balances without logging in. 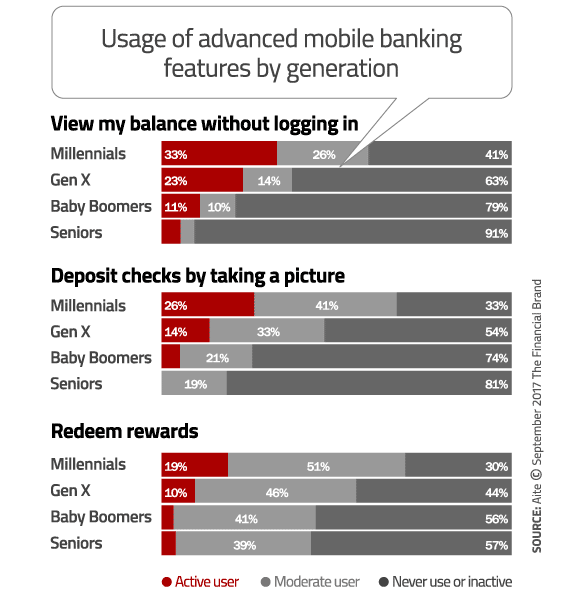 Millennials are also the demographic most likely to use remote deposit, with 67% using the function at least once per month compared to only 36% of Baby Boomers and 19% of Seniors. Tip: You should tailor your mobile marketing messages based on the demographic segment(s) you are targeting. Baby Boomers and Seniors would prefer you keep it simple since they don’t need as many bells and whistles, while Millennials and Gen Xers use and appreciate more sophisticated mobile banking features. Perhaps because they watched their parents deal with the fallout of the financial crisis, are burdened with student loan debt, or are in the throes of saving for a home, Millennials are actively engaged in managing their financial lives. 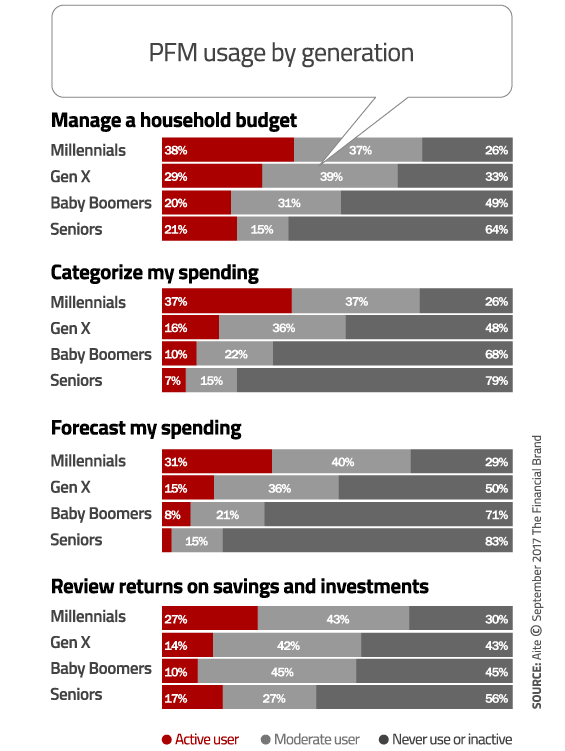 About three-quarters of Millennials use digital financial planning tools at least once per month to manage their budgets, categorize and forecast spending, and review investment and savings returns. Tip: Be sure to provide Millennials with robust personal financial management tools to help them manage budgets, savings, and debt. And offer them financial education and advice using digital channels. This article was originally published on September 5, 2017 . All content © 2019 by The Financial Brand and may not be reproduced by any means without permission.